Each property page is managed by an in-process object that implements either IPropertyPage or IPropertyPage2. Each page is identified with its own unique CLSID. An object specifies its support for property pages by implementing ISpecifyPropertyPages. Through this interface the caller can obtain a list of CLSIDs identifying the specific property pages that the object supports. If the object specifies a property page CLSID, the object must be able to receive property changes from the property page. Any piece of code (client or object) that wants to display an object's property sheet passes the object's IUnknown pointer (or an array if multiple objects are to be affected) along with an array of page CLSIDs to OleCreatePropertyFrame or OleCreatePropertyFrameIndirect, which creates the tabbed-dialog box. The property frame dialog instantiates a single instance of each property page, using CoCreateInstance on each CLSID. The property frame obtains at least an IPropertyPage pointer for each page. In addition, the frame creates a property page site object in itself for each page. Each site implements IPropertyPageSite and this pointer is passed to each page. The page then communicates with the site through this interface pointer. Each page is also made aware of the object or objects for which it has been invoked; that is, the property frame passes the IUnknownpointers of the objects to each page. When instructed to apply changes to the objects, each page queries for the appropriate interface pointer and passes new property values to the objects in whatever way is desired. There are no stipulations on how such communication has to happen. 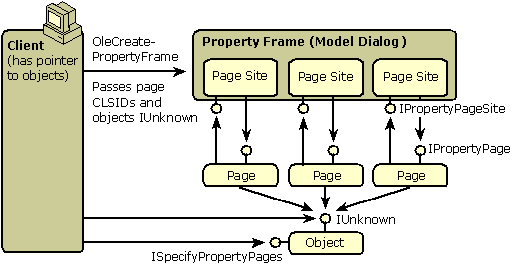 An object can also support per property browsing through the IPerPropertyBrowsing interface permitting the object to specify which property should receive initial focus when the property page is displayed and to specify strings and values that can be displayed by the client in its own user interface. The ISpecifyPropertyPages::GetPages method returns a counted array of UUID (GUID) values each of which describe the CLSID of a property page that the object would like displayed. Whoever invokes the property sheet with OleCreatePropertyFrame or OleCreatePropertyFrameIndirect passes this array to the function. Note that if the caller wishes to display property pages for multiple objects, it must only pass the intersection of the CLSID lists of all the objects to these functions. In other words, the caller must only invoke property pages that are common to all objects. Retrieve the current language used in the property sheet through GetLocaleID. Ask the frame to process keystrokes through TranslateAccelerator. Notify the frame of changes in the page through OnStatusChange. Obtain an interface pointer for the frame itself through GetPageContainer, although there are no interfaces defined for the frame at this time for this function always returns E_NOTIMPL. The property frame instantiates each property page object and obtain each page's IPropertyPage interface. Through this interface the frame informs the page of its page site (SetPageSite), retrieves page dimensions and strings (GetPageInfo), passes the interface pointers to the affected objects (SetObjects), tells the page when to create and destroy its controls (Activate and Deactivate), instructs the page to show or reposition itself (Show and Move), instructs the page to apply its current values to the affected objects (Apply), checks on the page's dirty status (IsPageDirty), invokes help (Help), and passes keystrokes to the page (TranslateAccelerator). A way (through IPerPropertyBrowsing) for the object to specify predefined values and corresponding descriptive strings that could be displayed in a client's own user interface for properties. An object can choose to support (2) without supporting (1), such as when the object has no property sheet. To specify its support for such capabilities, the object implements IPerPropertyBrowsing. Through this interface, the caller can request the information necessary to achieve the browsing, such as predefined strings (GetPredefinedStrings) and values (GetPredefinedValue) as well as a display string for a given property (GetDisplayString). In addition, the client can obtain the CLSID of the property page that allows the user to edit a given property identified with a DISPID (MapPropertyToPage). The client then instructs the property frame to activate that page initially by passing the CLSID and the DISPID to OleCreatePropertyFrameIndirect. The frame activates that page first and passes the DISPID to the page through IPropertyPage2::EditProperty. The page then sets the focus to that property's editing field. In this way, a client can jump from a property name in its own user interface to the property page that can manipulate that property.